We stock a wide variety of poultry equipment, poultry supplies, incubators, chicken coop, hen houses and other poultry farm equipment for sale. We welcome visitors, simply give us a call to ensure we are at home. We work 24/7. We also offer (by arrangement) a full nationwide stock and equipment delivery service. What size of hut do I really need!? Hut Suppliers as opposed to those who keep poultry tend to rate their huts generously in terms of capacity. The quality of hut construction varies widely, too often they are flimsy, stapled together and untreated thin material made to look good. We strongley reccommend you touch and feel before you buy and check the specification carefully. All huts/coups/runs have tanalised structural frames and all parts are treated with a preservative. We reserve the right to make small changes to the design with respect to position of struts, doors and nest boxes. Cladding: 5/8” Tongue & Grooved, Shiplap, or feather edge boarding pressure treated. Roofs are covered with T & G, feather edge or Unduline. All our huts & runs are "Fox proof" as standard. All huts have two perches and all runs have two perches. Please scroll down to view our extensive range of poultry accommodation available. To see any of them in a larger size simply click on the picture. Happy browsing! Hut on Legs: L39”x W38” x H49"
L108”x W38” x Hut H49” x Run 26"
Run with easyclean base is 9ft x 38"
Features: Block of 2 exterior nest boxes. Single Perch in run, 2 perches in house. Features: Walk-in rear access for cleaning etc. 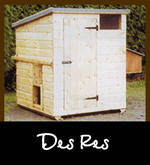 Features: Suitable housing for 8-12 Large birds, complete with integral perching bars and nest box. ‘Onduline’ roofing sheet overall. Features: Block of exterior nest boxes and 2 perches.